Since I decided on two additional triathlons, one sprint and one olympic, training has picked up during the past few weeks. While I had stayed active and continued to swim, bike and run throughout July, having the races on the calendar give me more structure to my training sessions. This has been just what I needed to get excited about the coming weeks. 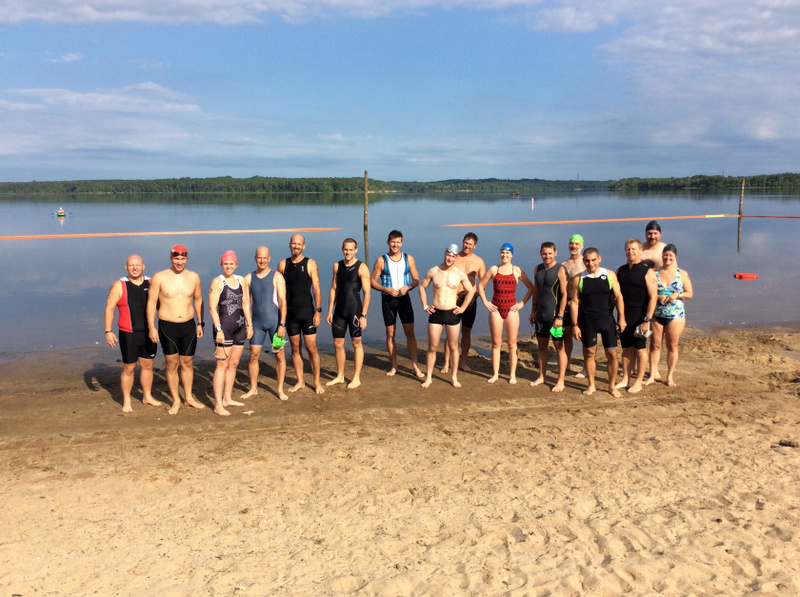 Swim: I have been able to get in open water swims for the past four weekends. I have a pair of new swim buddies that are just as anxious to get in time at the lake as I am. One of them also has a kayak, so his wife provides swim support, which is awesome! My time at the pool has been pretty typical…but I feel I have had more good days than not. Bike: I am still really enjoying the bi-weekly group rides from TriLife. I try to go on both Tuesday and Thursday, schedule permitting. These rides continue to challenge me, plus they are fun! Run: Tempo runs and intervals have returned in regular rotation. I have taken a more challenging approach to the speed intervals (from Tony’s suggestion), but I know pushing myself here will yield results. I also just got in a long run yesterday…a run longer than I have done in a while. (1). A 50 mile ride a few weeks ago where I was really able to push my pace. A group of us rode from TriLife on a Saturday morning….the group started at around 10 riders and quickly broke down into a couple of smaller groups. The guys I stuck with were some that I ride with regularly during the week. I enjoy riding with them as we have similar riding styles. A solid challenge, but I felt great at the end! (2). 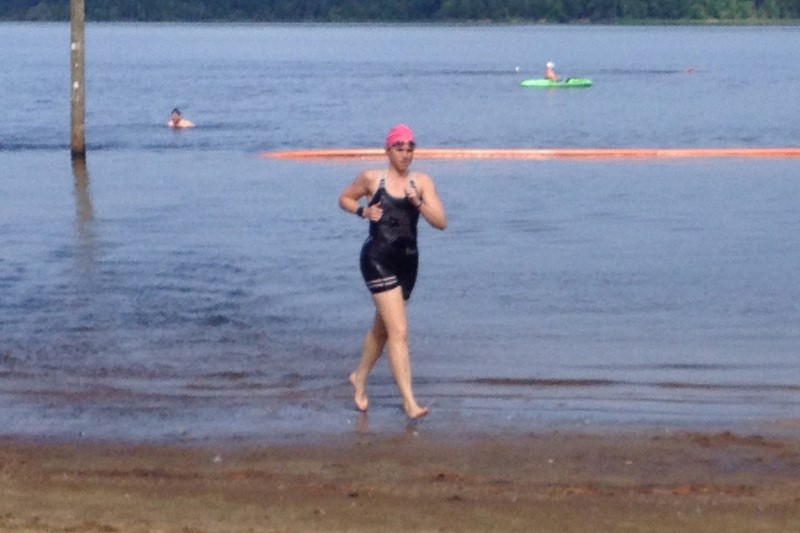 The second highlight was my open water swim this past Saturday. The total swim was .75 miles but it was all about how I felt! Before starting the swim we found two sight points to work with. The first was only about 200-300 yards out and then we turned and headed further out towards the middle of the lake. After we swam to the point we wanted, it was just a turn around and swim back to shore. I was feeling good and decided to push my effort the last few hundred yards or so of the swim back to shore. I did just what I wanted and was pleased. I try to finish strong in races, so I really should plan to try to incorporate this approach more in training to better simulate racing! (3). 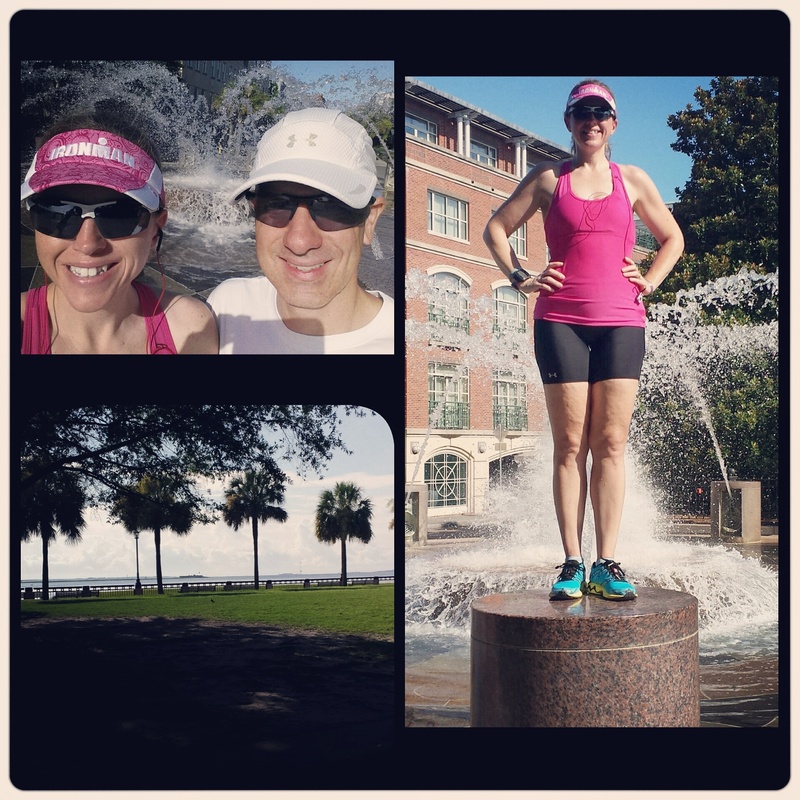 The third highlight was yesterday’s long-ish run. I have not really run anything over the 4 to 5 mile range in a while, so I wanted to go out and tackle 7 miles to get a current gauge. 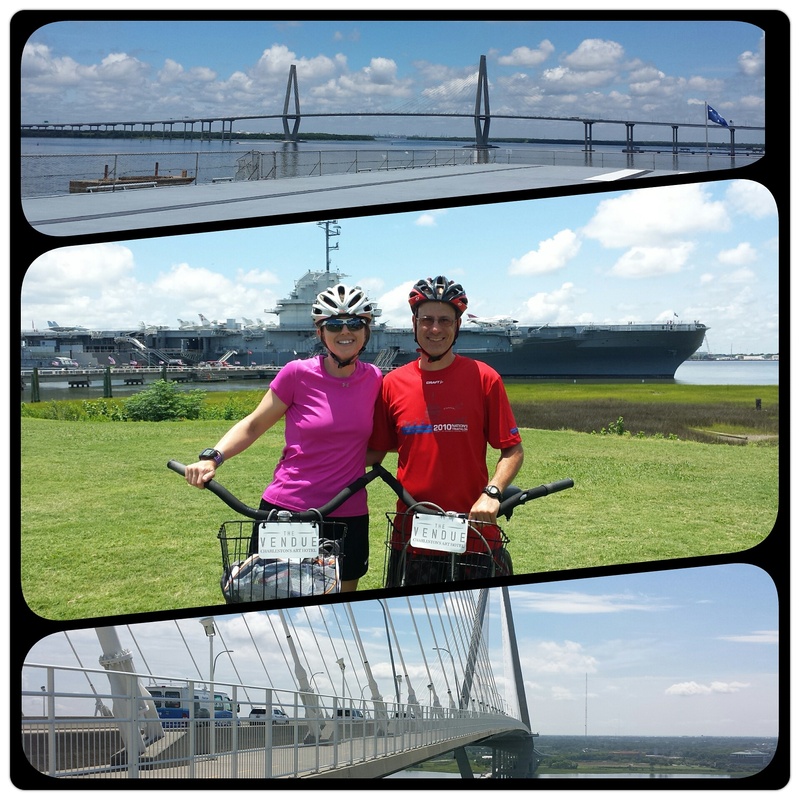 Tony and I hit the Greenway Sunday morning. He had 10 miles on his legs from the day before, so he tagged along with me for his recovery run. Despite having to back off a couple of sections to keep my heart rate from going too high, I was super pleased with my 8:50 pace for distance. I felt good when we finished and really no complainants overall! Looking to make steady improvements over the next few weeks! (4). The fourth highlight comes in the form of a “quasi” race report about an event called Throwdown (www.trithrowdown.wordpress.com). Throwdown is an event, open to all, that is produced by the owner of TriLife, Jon. 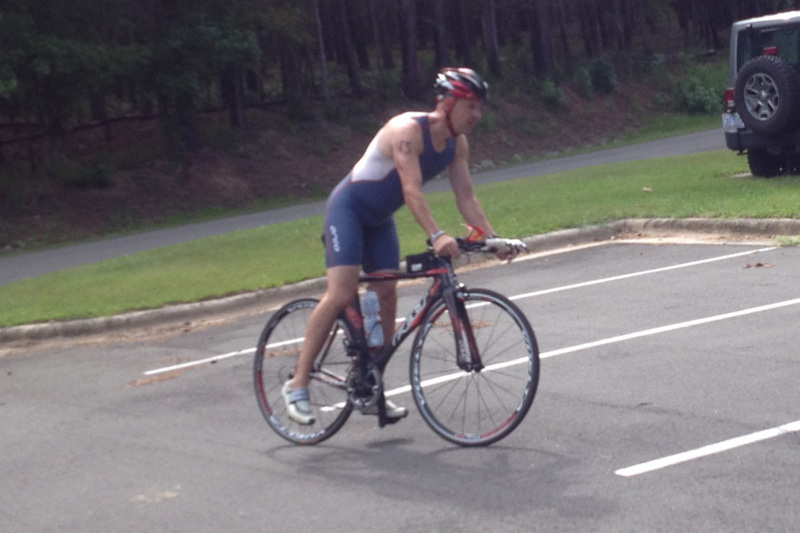 It is a “mock race” that is a sprint distance triathlon. There were 16 participants at the 8/19/15 event and we had a blast! This is still a relatively new concept and I expect participation will quickly grow. We did not have chips for timing, but Jon utilized a timing system to capture results. 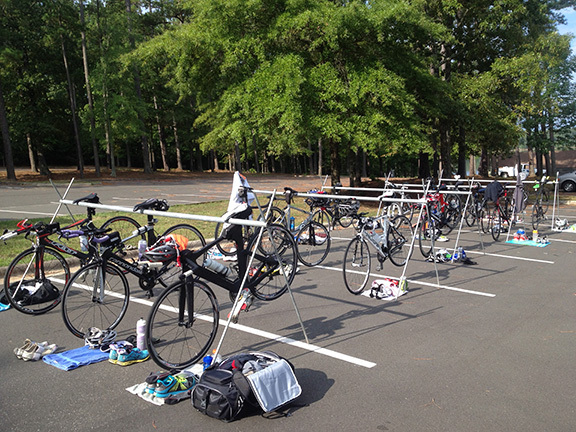 Just like any other race, there was a transition area set up with bike racks. It was great that we could park and then rack our bikes just a few feet away. I set up my transition area pretty much the way I would for an official race. Transition is one of the areas that I don’t really practice, so this is a great event to do just that! The swim did not have inflatable sight buoys this time, but there was one lake buoy we swam around and then out to a dock that served as the turn around. Going out on the swim the sighting was pretty good, but coming back it was a little more challenging. The planned distance was 750 meters, but I think we swam closer to 1,000 meters. I did not lap my time as soon as I got out of the water, which I will definitely do next time. The official T1 time did not start until we did a short run from the lake to the parking lot. With the “longer” swim course and me not tripping my time at a good point, I am not sure what true swim pace was. I felt pretty good on the swim though. Based on feedback, I think they will try to make the sighting a bit better for the next event. The bike was around 12.5 miles and the route included roads that are familiar from the group rides. I pushed pretty good on the bike and my Garmin had me at an average of 20 mph. The 5K run was entirely within the park and only had one incline, right at the beginning. After running up the hill and trying to settle into a comfortable pace, I felt like I should kick it up a notch. There was a section of the run that was on gravel and since I don’t frequently run on gravel I was not as comfortable as I was on the pavement, but I maintained well. The downhill finish was nice and I was pleased to be the “first female finisher” (the only time I have heard those words) out of the four women participating. I ran an average pace of 8:34 and my total event time was 1:32:05. Tony also participated in Throwdown and he had as much fun as I did. He had run 20 miles the day before (he is training for Marine Corp Marathon) and despite this and the very little swimming that he has done lately, he still beat me by 7 minutes! After the event, we all headed to Panera for lunch. It was a day of great fun and solid training to boot! I am already looking forward to the next Throwdown on September 6! There was one low light that sticks in my mind. It was last Tuesday’s group ride. We all took a chance in deciding to move forward with the ride, and not just jumping on trainers, but we paid the price. About 20 minutes in, we hit a bad storm with very heavy rain. We had modified the route “in case” there was rain, but we were a good distance out when it hit. We were SOAKED to the bone when we got back to the shop. To me, it was reminiscent of the rain I experienced in Lake Placid last year. The one good thing that came from it, is that I took a lot of time to really clean my bike over the weekend. I desperately needed it before it got rain soaked, so this was more incentive to get her in great condition! 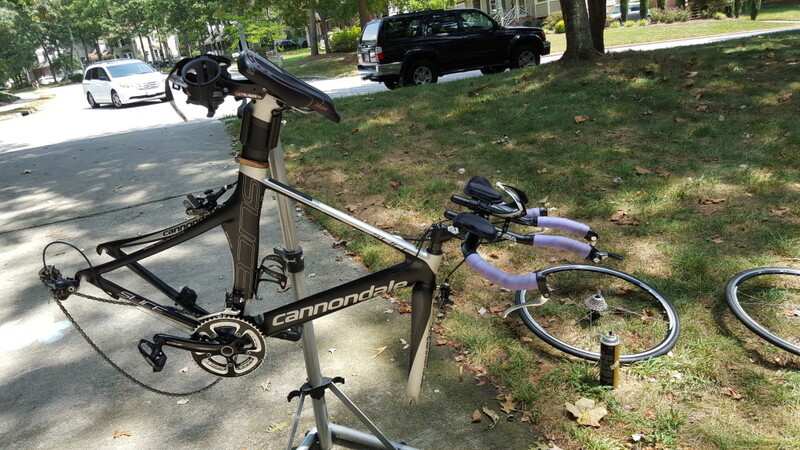 The Cannondale getting some TLC!!! Training is in a good place for me right now. I am enjoying it more than I can recently remember and looking forward to my upcoming events! The last few weeks have brought some much welcomed changes in my life. 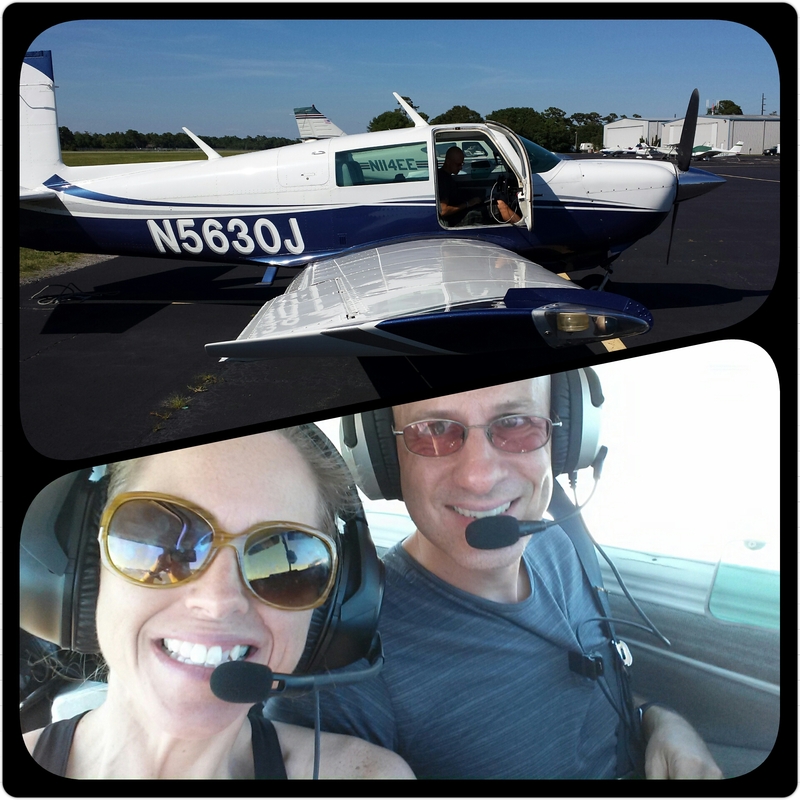 I don’t talk about my career on the blog, but I am going to make a slight exception here. I had been with my job for almost two years (and that was after being at my previous position for 7.5 years and that job being relocated to another city after a corporate merger). It had been clear for quite some time, that I was at a place that was not a good fit for me. Since I truly believe that life is short and you should do all that is within your power to make your world as happy and as healthy as possible, I found a new job opportunity. I am still working in the finance realm, but it is at a company that I am excited to join and welcome the new possibilities that I feel are in my path. I started the new job on July 13. With a bit of time before starting my new job, we decided to take advantage and get out of town for a few days. 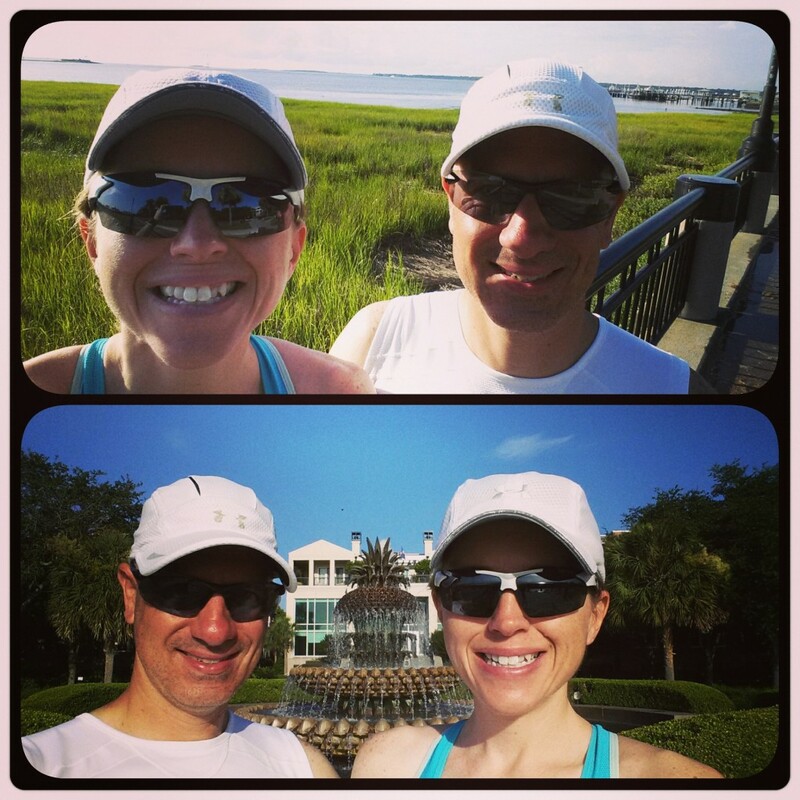 After much deliberation, we headed south to Charleston for four days/three nights. I had been there a few years ago with my college sorority sisters, but Tony and I had not been together. I found a super cute boutique hotel downtown that was in a great location that allowed us to walk to restaurants, shopping and other sites. 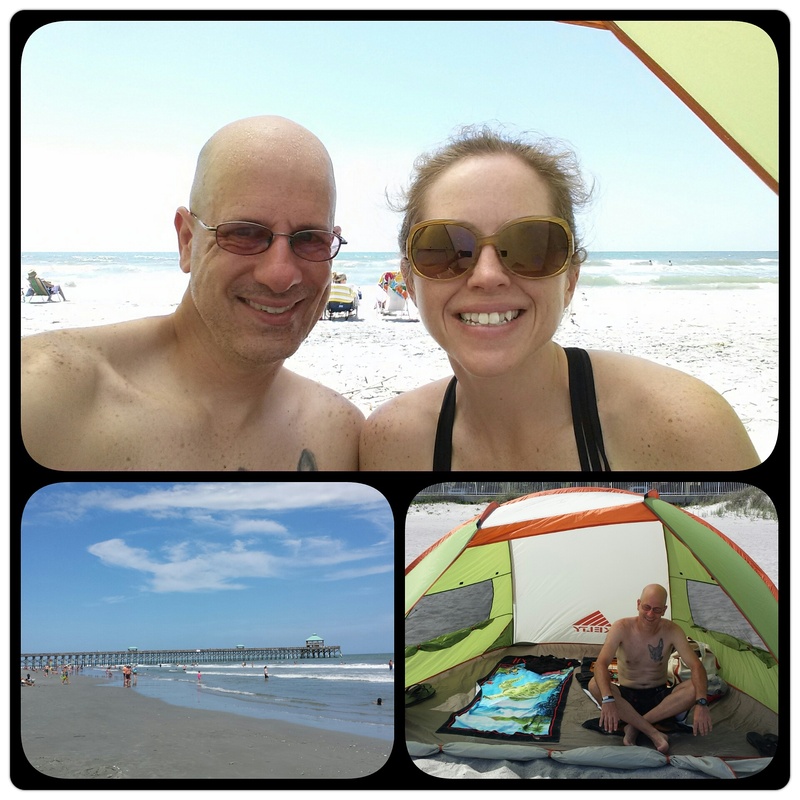 We only used the car once, when we drove out to Folly Beach to get our feet in the sand and feel the ocean breezes. We had great fun and I wanted to share some of the highlights via photos. 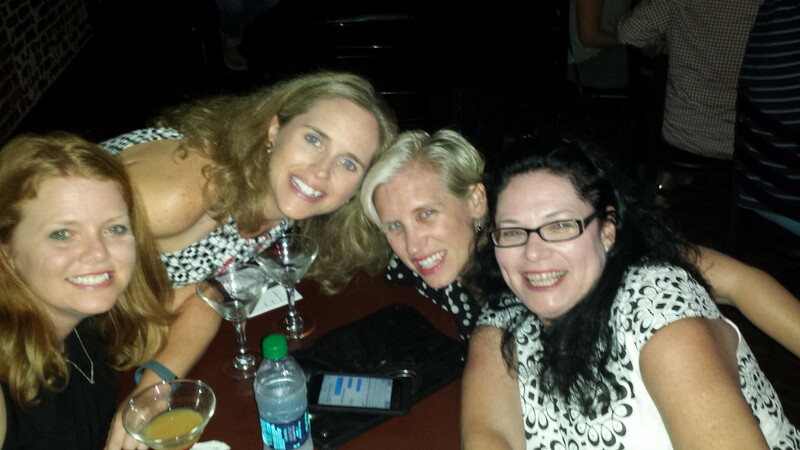 So the week of my new job, I worked three days, as I had a previously planned vacation with my college sorority sisters (the same group I visited Charleston with a few years ago). 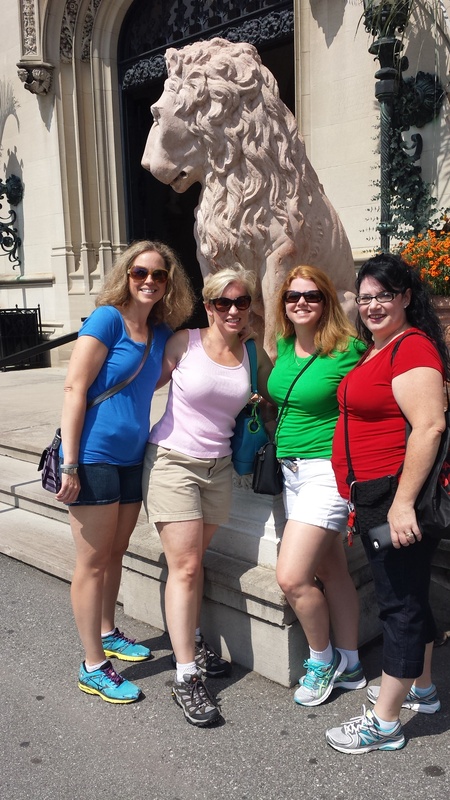 We go out of town for a girls’ trip once a year. This year we headed to Asheville, NC for a long weekend of great times! To top of the month of July that seemed to be full of travels, Tony and I headed down to the NC coast a couple of Saturdays ago for the afternoon. 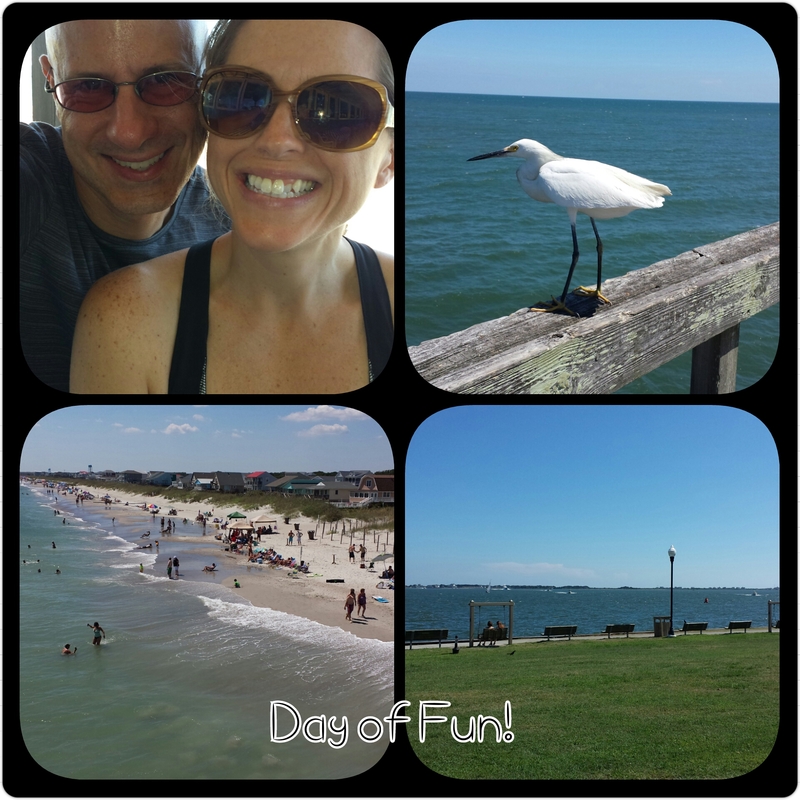 It was a fun impromptu trip on a beautiful day! 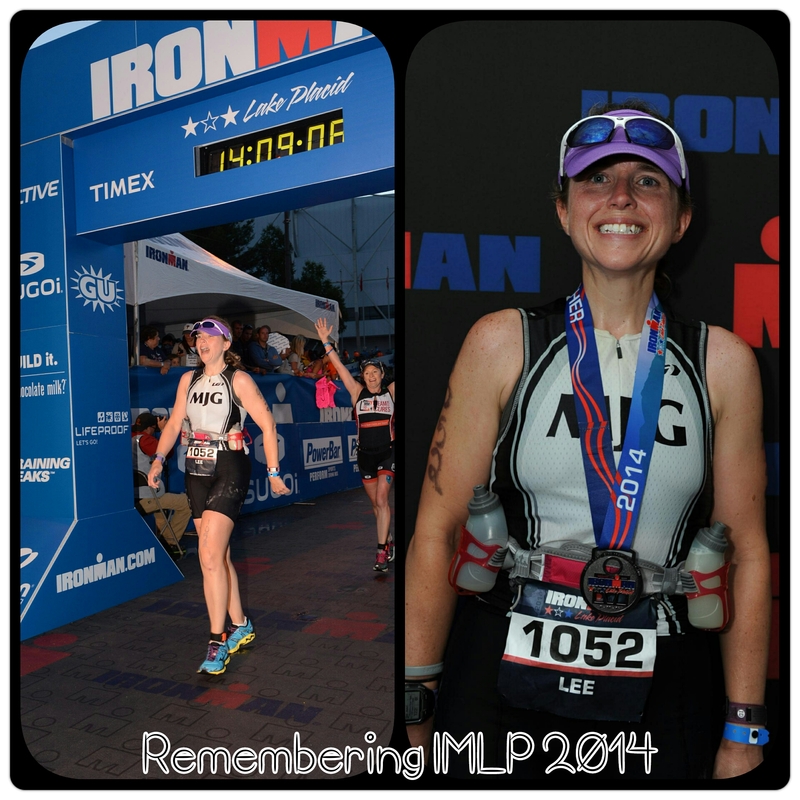 With Ironman Lake Placid 2015 happening last Sunday, my mind was full of memories from the day that was the most challenging yet most rewarding days I have had. Congratulations to all of this year’s finishers! July was a great month complete with fun and positive change. So now looking forward to later in the summer…. I have decided on two more triathlons to put on the calendar. I am planning a sprint at the end of August and an Olympic in early September. While I have still been active and training regularly, my workouts have not had the structure and focus that they typically have when training for specific race. I am glad to have some races to focus on and get some goals in mind. More on that to come!